Beat butter and sugar in the bowl of mixer with a paddle just until smooth. Add the egg, vanilla and lemon zest, again mix to combine. Add the flour, nutmeg, and salt, beat just until the mixer forms a dough. Remove from the bowl, flatten into a disk, and wrap with plastic. Refrigerate for at least 1 hour. Roll out to fit a 12” tart pan with removable bottom. Refrigerate for 30 minutes, then line with foil and place dried beans or baking beans to fill. Bake at 350F about 5-6 minutes, until the edges start to lightly brown. Remove the beans and foil, and bake about 3-4 minutes more, until the bottom is set and slightly browned. The dough may puff up, poke with a knife to release the steam. Remove and cool slightly. Soften the almond paste and butter separately in the microwave or leave at room temperature. Place the butter, sugar, and almond paste in the bowl of an electric mixer. Beat on medium high speed using the paddle, until light and fluffy, about 3-4 minutes. Add the eggs and vanilla, mix until combined. Add the flour and salt, mix until just combined. 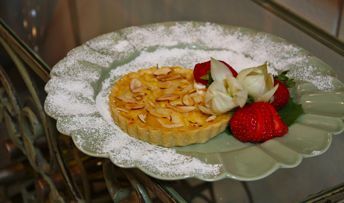 Spread the frangipane in the bottom of the pre-baked tart shell. Press the sliced pears into the frangipane in concentric circles. Bake at 350°F until golden brown and completely set in the center, about 20 minutes. Cool 30 minutes and brush the top with heated apple jelly or apricot jam and sprinkle with toasted almonds.